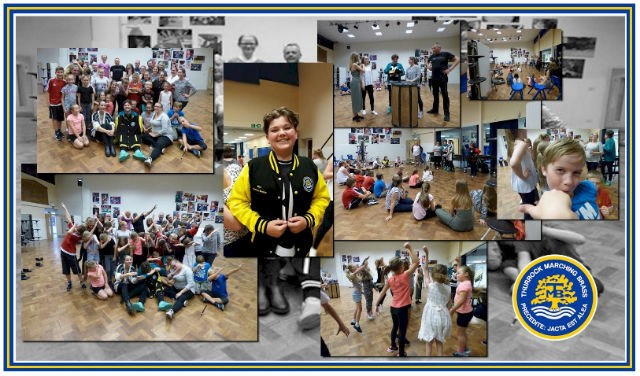 Thurrock Marching Brass was excited to welcome a group of friends who included Max Gill, who played Fat Sam in the West End smash hit Bugsy Malone, to their rehearsals. Max brought with him Kara-Jane Morallee and Sarah Ridley, both of whom have extensive theatrical and stage experience, and together they gave an absolutely brilliant masterclass in performance art and theatre to the kids. To say the members were excited is a bit of an understatement and they revelled in showing off their summer production entitled “Under New Management” to Max, Kara-Jane and Sarah. A show that they take on the road on Saturday 1 October to compete in the 2016 British Youth Band Association Cadet Class British Championships. There was fun, dancing, laughter, the banana song and a whole bunch of learning rolled into a two-hour session that saw a final run through from the members really showcasing all the things they had learned. Drum Major, Chloe Crowhurst and Guard Captain, Rhianna Leighton then joined Corps Director, Jay Lindner and Assistant Corps Director, Laura Pickton in presenting Max with his very own honorary TMB corps jacket, which fit him like a glove and put a smile on his face too. Speaking of the evening, our Corps Director, Jay Lindner had this to say “Every single rehearsal here at Thurrock Marching Brass I see something new and exciting. Often it can be one of our young members just managing to get something they had been working on for so long, or it could be something that makes me smile like when one of our fantastic parents does something for the kids, but tonight I never really knew what to expect when we welcomed Max, Kara-Jane and Sarah into our family. After just a few minutes it was clear that this was going to be such a fun time, and the way that all three interacted with our members was truly a wonder to see and experience. I can’t thank them enough for the time they have taken to come along and work with us all. The last performance of our production was magnificent in all areas and we are proving that you can create an entertaining program with youngsters and in such a way that small numbers in any section really doesn’t matter. I think this is quite new, and we are now perfecting a formula that can be replicated by others going forwards and what was really great to hear was that all three of our amazing and extremely talented guests really enjoyed working with us too. The banana song will become the stuff of legend here at TMB now I am sure of it. Thank you so much Max, Kara-Jane and Sarah for all you have done”. Posted by News Editor on Thursday, September 22nd, 2016. Filed under British Youth Band Association, FrontPage Feature.